Updates: Check the latest top 10 Instagram influencers in Malaysia chart compiled in 2019. There are some charts compiled programmatically out there but we feel that there are some key names missing from those compilations. Therefore, we decided to compile our own glamour chart, so here it is! 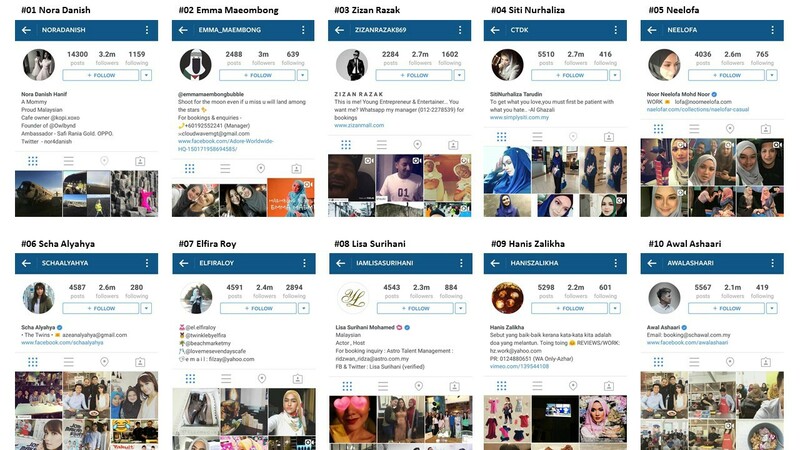 We present to you the top 10 Instagrammers in Malaysia (sort by the most followers, as of March 2016). 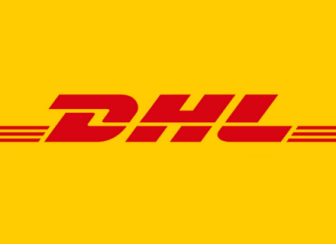 Click on image above to enlarge. If we missed out any names who deserved to be here, please let us know in the comment box below! Nora binti Mohd Danish Hanif (born 7 March 1982) or better known as Nora Danish is a Malaysian actress, model and television host. 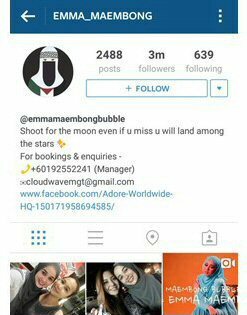 Fatimah Rohani binti Ismail (born 27 March 1992), professionally known as Emma Maembong, is a Malaysian actress and a model. She is best known by her roles as Munirah in Kau Yang Terindah, Nawwal Husna in Projek Memikat Suami, as Aryana is Yes Boss, as Medina Izwani in Isteri Separuh Masa and as Farhah in Tersuka Tanpa Sengaja. 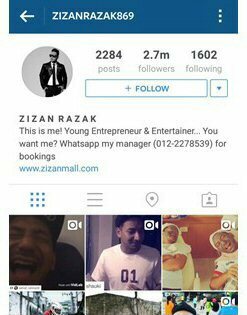 Abdul Razak Mohammad Razizan (born 15 April 1984), better known as Zizan Razak, is a Malaysian comedian. He is also a television host, actor, and most recently a rapper and a singer. He has also been in several reality television shows. He was runner-up (second place) in the first season of Raja Lawak ("King of Comedy"), a competition for comedians. Dato', or occasionally Datin Sri, Siti Nurhaliza binti Tarudin (born 11 January 1979) is a Malaysian singer, songwriter, record producer, television presenter and businesswoman. 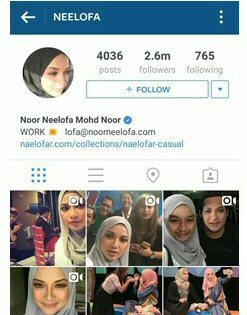 Noor Neelofa Mohd Noor (born 10 February 1989), better known by her stage name Neelofa, is a Malaysian actress, television presenter, and a commercial model. 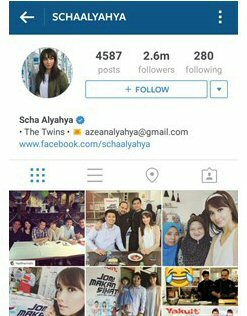 Sharifah Nor Azean Syed Mahadzir Alyahya (born 30 May 1983), better known by her stage name Scha Alyahya, is a Malaysian actress, model and TV host. She plays the lead character, Dania, in the highly rated TV series Awan Dania which aired on Astro Ria for three seasons that made Scha a household name. 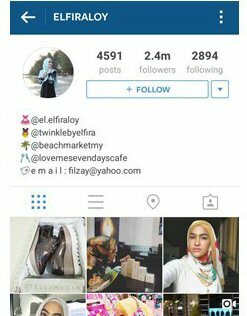 Nurul Elfira Loy Binti Ahmad Sabri (born March 8, 1994), better known by her stage name Elfira Loy, is a Malaysian actress. She debuted in her first telemovie drama Cinta Itu Buta where she acted as a school girl. She is known for her role as Qalesya in the hit drama Qalesya and as Amirah in Disney's Waktu Rehat. 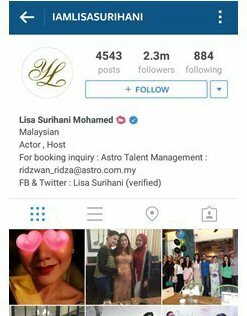 Lisa Surihani binti Mohamed is a Malaysian actress, model, television host and commercial model. Lisa Surihani binti Mohamed or better known as Lisa Surihani, was born on 23 March 1986 and raised in Kuala Lumpur to a family of Buginese and Chinese heritage. 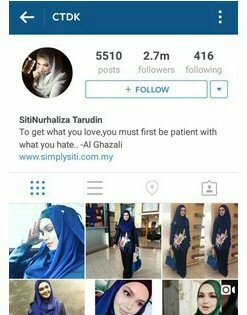 She is well known as a Malaysian actress, model, television host and commercial model. 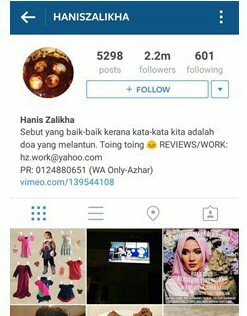 Hanis Zalikha (born 9 October 1990) is a blogger, model, actress from Kuala Lumpur, Malaysia. She has been shortlisted for Most Influential Blog Award in year 2011. 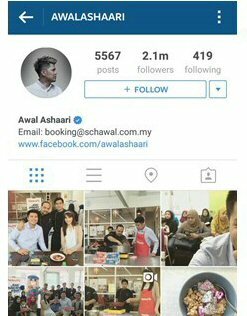 Ahmad Awaluddin Ashaari (born 6 August 1981), better known by his stage name Awal Ashaari, is a Malaysian actor, model and TV host. He was born in Kampung Baru, Kuala Lumpur, Malaysia. Note: Bio of all individuals above are summarized from Wikipedia. With Internet users spending more and more time on social media like Instagram, business and brand owners are trying to keep up with that too. Influencer marketing via key opinion leaders like the Instagrammers above is a good option to boost your brand awareness besides direct advertising, in-your-face advertisements. Key opinion leaders (KOLs) in Malaysia can be divided into 3 categories, namely Malay KOLs, Chinese KOLs and Urban KOLs. Most if not all of the chart-toppers above are Malay KOLs. Which KOLs should you engage with? It is all depending on your campaign objective and target audience, Talk to us if you wish to understand more about influencer marketing.